In honour of Lunar New Year, Wine Lister decided to examine wines with the strongest restaurant presence across parts of one of the major fine wine markets of today. Analysing presence in the best restaurants of mainland China, Hong Kong, Singapore, and Taiwan, the resulting top wines prove to be appropriate for this year of the pig – a Chinese symbol of wealth or fortune. The 12 wines (in this lunar year of the twelfth zodiac animal) with the best restaurant presence in these countries achieve an average price of £407 per bottle in-bond. Latour achieves the strongest presence, appearing in 86% of the best restaurants across China, Singapore, and Taiwan. On top of breadth, Latour also achieves depth, with an impressive average of 13.6 vintages and/or formats in each of these restaurants. Louis Roederer’s Cristal shares the horizontal presence top spot, even beating Wine Lister’s perfect Brand scorer, Dom Pérignon – the number one wine for presence in best restaurants worldwide. The remaining wines all achieve presence in 79% of the best restaurants across China, Singapore, and Taiwan, and make for an interesting mix of traditional candidates with some a little less expected. Perhaps the biggest surprise of all is not what appears, but what doesn’t – Lafite is conspicuous by its omission from the top 12 (with 71% presence). Though not making the top spot horizontally, Lafite does achieve vertical presence equal to that of Latour, with particular concentration in Hong Kong and Macau. The other three Bordeaux left bank first growths, Haut-Brion, Margaux, and Mouton all appear in the top 12. Achieving the opposite effect is Gruaud Larose, the only non-first-growth Bordeaux to feature in this top-12 list. 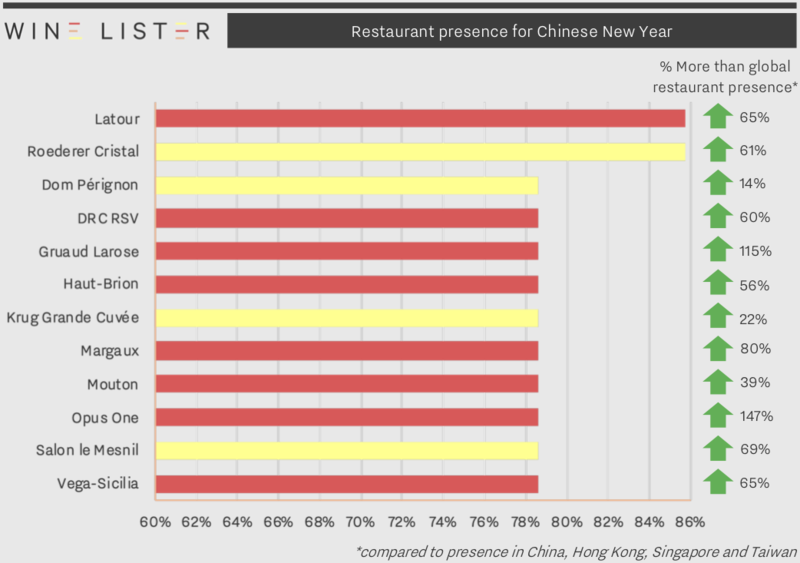 Its restaurant presence across China, Singapore, and Taiwan is an impressive 115% higher than in the rest of the world. It is also by far the least expensive of the group at £53 in-bond (over seven times less than the average price of the group). The sole Burgundy to feature is Domaine de la Romanée-Conti’s Romanée-Saint-Vivant, achieving 60% more presence across China, Singapore, and Taiwan than its worldwide average. For vertical presence it is overtaken by a handful of its rarer siblings – La Tâche, Richebourg, and Echézeaux, which achieve a collective average depth of 5.2 vintages and/or formats. Earning the most impressive concentration of presence compared to its global average is Opus One. It not only appears in 147% more restaurants across China, Singapore, and Taiwan than in the rest of the world, but does so with an average of 5.4 vintages and/or formats per restaurant. Also featuring among the top 12 wines for restaurant presence in China, Singapore, and Taiwan are Krug Grande Cuvée, Salon le Mesnil, and Vega-Sicilia Unico.